One family's journey into domestic adoption. I was asked to speak about our experience with adoption at a little event tonight with other adoptive families. I think I frightened all of the people who came. I was honest and clear about the scary and hard parts of adoption, and the responsibility and ethics it requires. I don't think I was encouraging. Adopting Verity has been one of the two greatest gifts of my life to date. It has also been the single hardest thing I've ever done, and the work of helping her feel right in the world won't ever end. Adopting is not for the faint of heart (although little of parenting is.) Getting to the moment where we knew that she would come home with us and that she was really and truly our daughter was worth it in a way I can't properly articulate. I would have done anything under the sun to make it so. It was also filled with more pain and fear than I think my heart could ever take again. I have never been laid so bare and defenseless or been so close the unmitigated loss of someone making such a sacrifice out of love, as Verity's birthmother did. And our adoption process was simple and smooth. Is it worth it? Oh heavens yes, and yes, and yes again. She is and was worth anything and everything. But I don't feel like I'm at the point in this journey where I'm able to sugar coat the truth. I know I'm late to the Halloween game - but bear with me. Last year at this time we were matched with a con woman, gestating a very possibly imaginary baby, and on October 30th we carved a pumpkin for that baby. I carved star, and when we lit it, the flame guttered out, which as omens go, is not a great one. We then carved a tiny heart into the back of the pumpkin, trying to get some more oxygen to the candle, and the flame stayed lit, and cast a heart shaped light onto the brickwork of the house. On November 1st, we discovered that we had been conned, and pick up the shattered little bits of our hearts for the 5th time in 5 years, and moved on. I seriously considered throwing in the towel, another child was clearly not in our future, and I didn't know if I could really bear it. What I didn't know then, is that three weeks later our daughter would be born. That at that very moment, curled up snug in her first mother's belly, was a baby girl, almost ready to greet the world. There are four pumpkins on our porch, and the little kitty pumpkin was carved on behalf of our daughter, who really quite adores cats. She signs "kitty" enthusiastically whenever she sees one, and has even learned how to pet our cat Billy, very very gently. She is real, she is here, and in less than three weeks, she will turn one. What a wild and beautiful ride. I have a lot of writing to do - to talk about what it was all like. The phone call, the trip to Virginia, meeting Verity for the first time, the revocation period, these first 5 weeks. But I can't yet, I don't have the brain space, and everything is just rattling around fresh and raw and amazed. What I can say, what I can say over and over and over again - because it keeps becoming really obvious everywhere I turn - is that people are wonderful, and we have so very much to be grateful for as 2012 comes to a close. Newtown, CT is so much ugliness that I can't even speak about it, it's heart-shatteringly awful. But even as the news rolled in about that I felt I could speak with confidence about the light in people. They positively glow. 2012 was hard for us, heck, the past 5 years have seemed hard. I began to have a complex about the universe being out to get me, us, because in this one piece of our lives we could not reach comfort. We felt kicked, and kicked again, and then kicked some more. But that's gone now, the universe doesn't hate us (and no, cosmos, that's not an invitation). I know this because I saw the way people rallied around us when we needed them. When we got the call and went into full-on panic mode, our community came forward. Friends scrambled to get our dogs to the vet, paperwork faxed, our house taken care of, my cat fed and (ack!) litter changed. Family and friends, and friends of friends - DOZENS OF THEM - donated to our adoption fund, making the scary scary expensive last minute travel doable. We could breathe because of the kindness and generosity of those around us. People offered lodging, and reached farther into their own circles to find us help. We drove pell-mell towards Virginia secure in the knowledge that whatever we left in our wake here at home would be taken care of, because people here loved us and were willing to show it. Our daughter Adeline was safe and in incredibly loving arms with Ben's parents, with extra visits and love from the honorary Aunties. I knew whatever she needed she would have, because of that community. We missed her in a visceral way - the longest we've ever ever been gone, but we knew she was loved, and that made it doable. When we got to Virginia and holed up in our hotel for the most frightening week of our lives, a woman named Patricia, whom we had never met - a friend of a friend of a friend - came to our hotel and loved on us, and arranged meals and little gifts for us every night of our stay. Strangers made us hot meals, sent clothing for Verity, cookies, little presents. Strangers who had no reason in the world to help us. We were all alone in that city and she made us feel like old friends, and when I needed to find something in Portsmouth, she made sure I knew where to find it. I feel certain she would have done whatever we needed her to, even with 4 children and a busy community of her own to tend to. She admired our daughter and heaped encouragement and support upon us. She was on fire with goodness and I will never be able to repay her kindness. When we returned home we were met with a house that was so clean and good smelling. Festooned with pink streamers and ribbons, and snowflakes and pictures made by our dearest friend's children. There were gifts, and chili and rice and cornbread, and cards, and a banner that said WELCOME HOME. We felt so welcomed. People keep saying that Verity is so lucky - as though she somehow benefits from being saved by our little family. This makes me laugh, because domestic adoption of newborns doesn't work that way - there was a long line of people that would have swept in to be Verity's parents if we hadn't said yes. Many of those families are probably wealthier or happier or better adjusted than we are, although I like to imagine that they weren't the Right family, because we are. I insist when they say she is lucky that no, we are the lucky ones, because Ben and Adeline I believe that we've won the lottery, we feel like we robbed a bank and they are letting us keep the money. 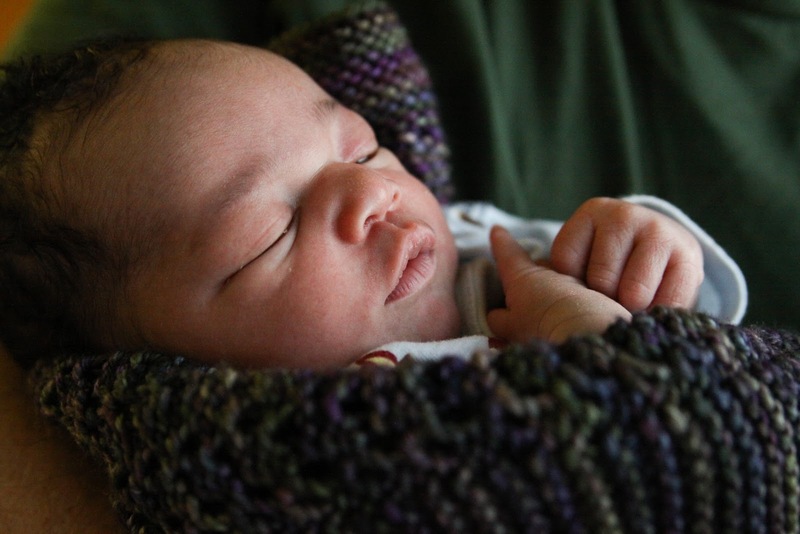 This beautiful soul encased in the sweetest little brown baby is in our family now. Could we be luckier? But there is something that gives me pause in all of this. Maybe Verity is lucky - not because she was adopted - because let me be clear that we did not save her, but because she has brought out the very shiniest aspects of those around us. She has champions in every corner, and her first weeks seem to hold all of the auspicious signs that come with being born a Dragon in the Chinese Zodiac. She is lucky. All by her herself. This is Verity Ruth Campbell Baugh. She's our daughter. I only have a moment, but someone appropriately pointed out that our last blog entry is rather dire- and suddenly there is a flurry of motion. A baby girl was born yesterday morning at 5:29am. and she very well may be our daughter. We got the call at 7:51pm this evening. We've been "matched" with her and we travel tomorrow (as soon as we have clearance from our agency) to meet her. My head is a flip top right now. I am filled with panic and shock at having to throw together a plan to be away from hearth and home and Adeline for 2 weeks. Tomorrow is Adeline's birthday. She was born on Thanksgiving 7 years ago. This baby girl, in a hospital in Virginia, was born on Thanksgiving. What are the chances? Will we have two daughters born on Thansgiving? We're speechless, and terrified, and it doesn't feel at all real. We'll meet her, and on Monday she will be discharged from the hospital to us where we will stay in a hotel with her until ICPC clears and the revocation period (the time which her birth mother has to change her mind and decide to parent) is up. And then we will bring her home. That's the plan. More to come when we can share more. Send vibes. We need them. Here it is, that thing we were warned sometimes has to happen. The thing we knew could happen. We got a call from the agency today. Some information has come out revealing the woman we were matched with to be a convicted scammer. They have unmatched us and are pursuing legal action. We're feeling hurt and bewildered - but also really relieved that the agency we are working with did the legwork when something seemed fishy, and that they protect us from financial risk - all of the money that we've spent comes back to us, allowing us to continue our journey to adoption. So, we are back to "Active" and waiting with our agency, and would love for everyone to spread the word. Our baby is still out there, we know it. So, in the interest of full disclosure (ha, ha) - and because I don't want to leave you hanging (whoever you are), I need to share. But I do so with the caution that our agency suggests that we don't tell the wider world this, because we might just have to untell. But, hey, whatcha gonna do? Yup, right now there is a little bitty baby growing that may someday come home to us, be our son or daughter. On Friday afternoon, while in TN with friends, my phone rang. It was our agency's number, and I knew as soon as I saw it that it was THE call. I went outside and answered it, with Ben right behind me. And the woman on the phone told us a beautiful thing. An amazing expectant mother has picked us, from out of many families, to be the family for her baby. I am not going to give any details, because they really don't matter - it can all become clear if this works out. What can I say? There is a baby, in another state, due to arrive earthside in the spring. We are in love with everything about the situation, aside from the wait. A lot can happen before spring comes. But we have faith that what will be, must be. Oh little baby, we love love love you. We are Ben, Sarah, Adeline, and Verity: a family of four built through biology and domestic newborn adoption. After five years of secondary infertility and recurrent miscarriage, which was hard as heck, we are so very happy to have completed our family!